This site is a coastal ridge site with a well landscape small park used as the launch site and easy public access to the Beach. Access is off the only Shell Beach exit off Highway 101. Set up is accomplished on the open lawn area where Paragliders are encouraged to raise there wing and walk out to the cliff to launch. This seemingly benign ridge site is however, fraught with serious hazards which have been responsible for the most serious injuries in the club in the last 5 years. We ask anyone new to the site that they be accompanied and checked out by a knowledgeable local pilot or instructor prior to flying this site. The ridges are rock faced with some beach extending north but mostly south to the first point. Access from the Beach is available on either side of the park/launch area. Top landing, preferably on the grass areas is readily achievable. Under favorable conditions paraglider can precede further south of the point in front the hotels but the pilot should be aware that the shore is rocky and no landing locations are available in front hotels. Similarly, the residential areas come up to the ridge and the beach shortly turns to rocky shore as one flies to the north. It is Highly recommended that new pilots be accompanied and checked out on hazards and appropriate use of this site by knowledgeable local pilots before flying this site. Skills level required by site conditions: Intermediate level pilot (P-3). Due to the special hazards of the site Novice (P-2) level pilot are not recommend even with instructor supervision. Please use only designated areas for launching and landing. See description above. All pilots should wear a helmet along with standard foot and back protection. 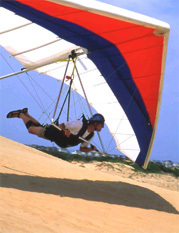 Powered paragliding or hang gliding is Not allowed under threat of loss of this site. Please respect the wishes of the city, local residence and hotel owners request to not operate powered aircraft in the area. The rocky ridges are steep and generate fairly significant rotor and unusual wind currents which can put you into the rock face. In addition a very large tree is located on the very edge of the ridge 1000 feet south of launch which has a history of snagging Paragliders as they pass. Finally, winds generally come on around noon and are good for one to two hours, but often blow out in the afternoon. As the wind grows in strength, you can easily be blown back into residential and commercial structures that the line the ridge. Take care! Intermittently good most of year, usually when other local sites are not working. Can launch WSW to NW wind 10-15 mph. The site can thermal block but winds come around the San Luis Point and tend to blow out the block generally making it a site clearly on or off. If the winds are on the light side and/or switchy on and off again, it may not be a good time to fly it.